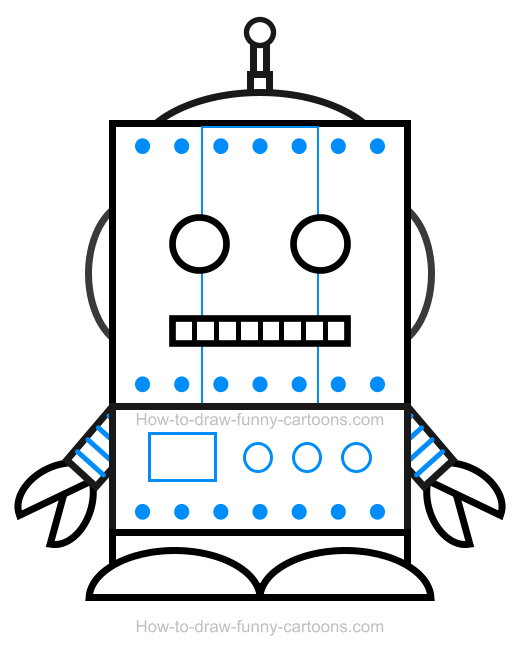 Assemble all pieces and create an adorable robot clipart that is simple, but visually appealing. 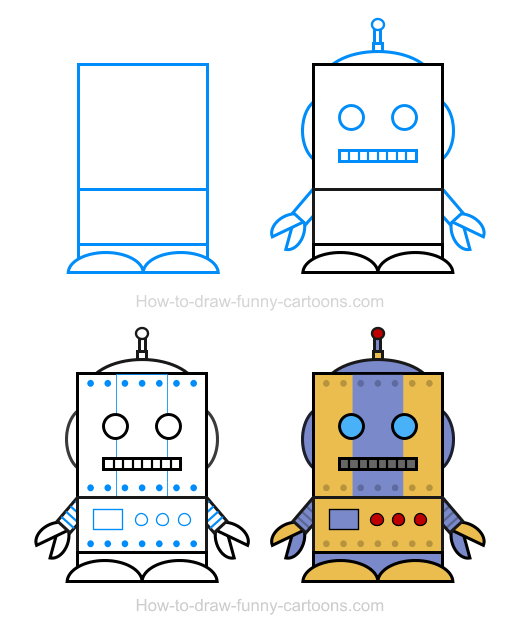 Yes, I will show you how to create the cute robot available below using only rectangles, circles and lines in just four easy steps. This lesson is so simple that anyone can create a cool character like this one within minutes! This first step is rather simple. Start by adding the head using a large square. Below the head, draw a medium rectangle to illustrate the body. 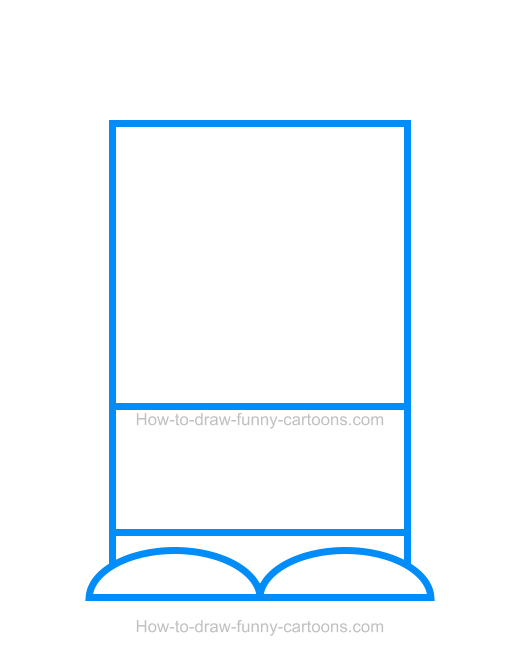 Then, draw a smaller rectangle to form the legs. All three shapes must have the same width. Complete this step by sketching the feet using curved lines. Good! It's time to make this character more ... robotic. Inside the head, draw the eyes using circles and the mouth using a small rectangle. Curved lines are added to create the ears and the antenna on top of the head. Then, you can add the arms using small rectangles and the hands are made from curved triangles. Inside the head, draw a long vertical patch between the eyes. Dots are also drawn on top and bottom of the head as well as on the bottom of the body. Draw a few basic shapes on the body and add some lines inside the arms. Great! This character looks great, but let's see how we can make it better by adding relevant colors. A robot can be filled with a bunch of grey colors, but that's not very appealing. In this case, I have selected a bright yellow color and a subtle blue one. Buttons on the body and on top of the antenna can be filled with a bright red color. Only the mouth is grey to make this one easier to read. You can see below how colors are applied on the character. 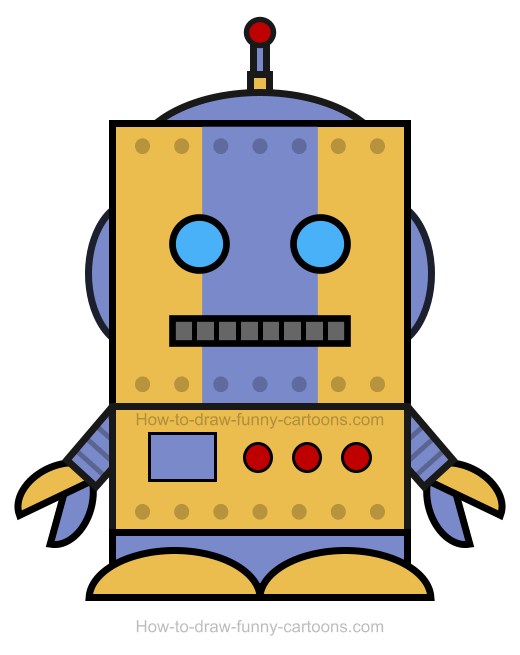 That's a beautiful robot clipart! Good work!